Industry Experts, Inc. released an updated 2018 version of its global market report on Glass Fibers. The new report entitled “Glass Fiber Reinforcements – A Global Market Overview“, reveals Asia-Pacific is the world’s largest market for Glass Fiber Reinforcements in terms of both volume consumption and market value estimated at 2.7 million metric tons valued at US$3.6 billion in 2017. Glass fiber is the most widely used reinforcement fiber in thermosets and thermoplastics across a wide variety of applications. This material is the predominant fiber in composite materials used in corrosion-resistant pipes and tanks, bridge decks, boats and wind turbine blades. It is also the dominant reinforcement for automotive composites. In aerospace, too, most of the panels that form the interior cabins of commercial aircraft are based on glass fiber. Glass fiber reinforcements market is forecast to record a CAGR of 5.4% from 2017 to 2022, attributed to growth in the key end-use application sectors such as wind energy, automotive & transportation, building & construction and pipes & tanks. 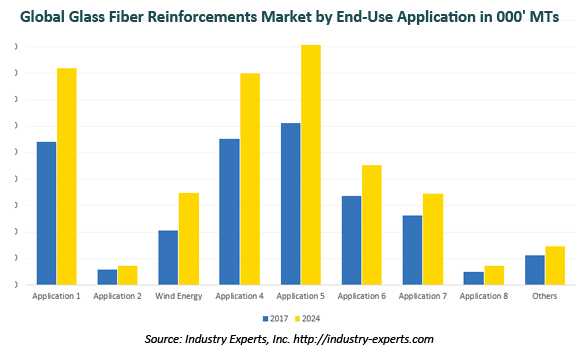 Driven by growth in the key application areas such as automotive, pipes & tanks, construction and wind energy, the global glass fiber reinforcements market is projected to reach US$12 billion, reflecting CAGR of 5.1% during 2017-2024 analysis period. The market is anticipated to record lower growth in value demand compared to volume consumption during the above period due to decline in average prices of glass fiber reinforcements worldwide because of overcapacity, mainly in China. The study analyses the market in terms of volume consumptions in metric tons as well as value in USD. The report explores the market for end-use applications of Glass Fiber Reinforcements comprising Automotive & Transportation, Marine, Wind Energy, Pipes, Tanks & Other Corrosion Resistant Equipment, Building & Construction, Electricals & Electronics, Consumer Goods, Aerospace & Defense and Others. This report also examines the market for Glass Fiber reinforcements by product form such as Single-end Rovings, Multi-end Rovings, Woven Rovings, Chopped Strands, Chopped Strand Mat (CSM), Continuous Filament Mat (CFM), Fabrics and Other applications for global, regional and country level markets. The report reviews, analyses and projects the Glass fiber reinforcements market for global and the regional markets including North America, Europe, Asia-Pacific and Rest of World for the period 2014-2024. The regional markets further analyzed for 14 independent countries across North America – the United States and Canada; Europe – Germany, France, Italy, the United Kingdom and Spain; Asia-Pacific – China, Japan, India and South Korea; Rest of World – Russia, Turkey and Brazil. This 364 page global market report includes 225 charts (includes a data table and graphical representation for each chart), supported with a meaningful and easy to understand graphical presentation, of the market. The statistical tables represent the data for the global market by geographic region, product segment and end-use application. This report profiles 10 key global players and 70 major players across the North America – 13; Europe – 17; Asia-Pacific – 34; and Rest of World – 6. The report also provides the listing of the companies engaged in the manufacturing and supply of glass fiber reinforcements and their downstream products such as fabrics, prepregs etc. The global list of companies covers addresses, contact numbers and the website addresses of 109 companies.